"This proves something that I've known for years: no matter how great a kitchen technique is, unless you use it regularly, you'll forget about it. 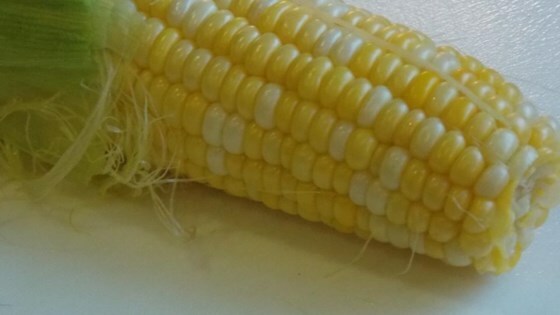 This technique for making corn on the cob works perfectly, and I hope you give it a try soon." Heat corn in the microwave until cooked through and tender, about 3 1/2 minutes. Hold the tapered end of the corn with a towel over a cutting board. Cut the bottom 1-inch off of the thick end of the cob. Squeeze tapered end of corn cob out of husk and silk. Spread butter over corn and season with salt. Discover the easiest, fastest way to make perfect corn on the cob. Useless unless you only do 1 or 2 cobs. Not worth your time when the family is over. Good for just a few ears, for larger quantities use the oven @ 350F 30 min cook time, same result. Used this method and then shucked the corn and grilled for a few minutes to get a light char. Delicious!!! Will definitely use this method again!!! Excellent.........great corn on the cob and could not believe how easy chef John made it. This is how we will do our corn on the cob from now on. Thank you. Amazing!! This corn came out of the husk squeaky clean. For small gatherings it will work. Keep it up Chef John.